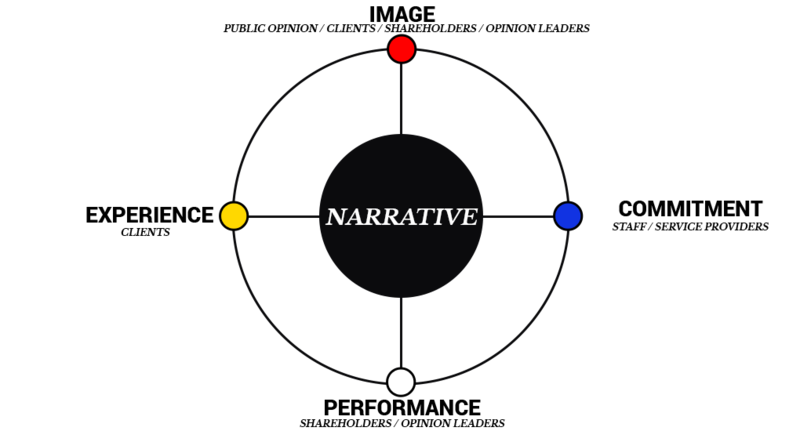 Develop narratives – on the basis of an expert diagnosis of public expectations. Critical insights — drawn from rigorous research of public opinion trends, aspirations and fears. Powerful narratives — emotive, engaging and authentic. Narratives that establish consistency among the key factors for the company and the brand success. Identification of opinion risks, hostile narratives and response strategies. Establishing connections with opinion leaders. Research , selection and management of specialized providers. Our customer’s environment has changed profoundly, therefore the needs of its audiences have also changed; and its new B to C activities increase exposure to opinion risk. Our client realizes that it is not sufficiently connected to opinion and asks us to help renew its message. Creativity workshops inspired by ad-hoc diagnoses and trends. Expression of a renewed promise. Design of a ToDoBook to epitomize this promise through new initiatives and business development. A mass consumer brand in identity crisis (blurred personality, scattered positioning) struggles to create value. The brand needs to launch a new narrative that is strong enough to generate preference with customers and stimulate employee commitment. 2. Develop a new brand narrative connected to the profound public opinion needs. A brand book used in each country to spread the narrative and renew advertising expression. Engaged in a transformation plan, our client, a major player in the transport world, is facing social tensions and internal resistance. In order to promote change acceptance, it is necessary to set up a new vision to give actions meaning and restore confidence in the future. 1.Interviews with senior executives and experts, barometer of the social climate, market studies and workshops to co-create a new vision that achieves consensus. 2.Expression of new vision in internal initiatives (management culture and communication, know how, key skills) and external (new advertising expression, product image and « premiumisation»). An adaptation of basic principles inspiring all brand and company actions. What about digital engagement ? For a senior executive at one of our client firms, No Com developed an ad-hoc digital approach consisting of social media coaching to define the “editorial line” and give social media posts a clear intention. We are a completely independent firm, communication strategy consulting is our only business. We tailor our support, intervention and availability to the individual corporate need. We aim to bring together all stakeholders at each key stage, especially during thinking design workshops. Together, we devise strategies that engage managers and employees to transform the internal organisation and customer experience.